Can’t believe it is almost March…the time just flies by when you are having fun!!!! I am busy steaming and getting ready to edge-finish my Cat rug and enjoying it myself!!! …I feel greatly blessed to be able to enjoy such a fun art-craft…one that gives me great pleasure!!! 🙂 I hope you all have something that brings you fun and enjoyment too!!! I am working on several designs that I’d like to do but haven’t settled on one quite yet. But even the design process and the “thinking” is a pleasure. So many ideas to explore. 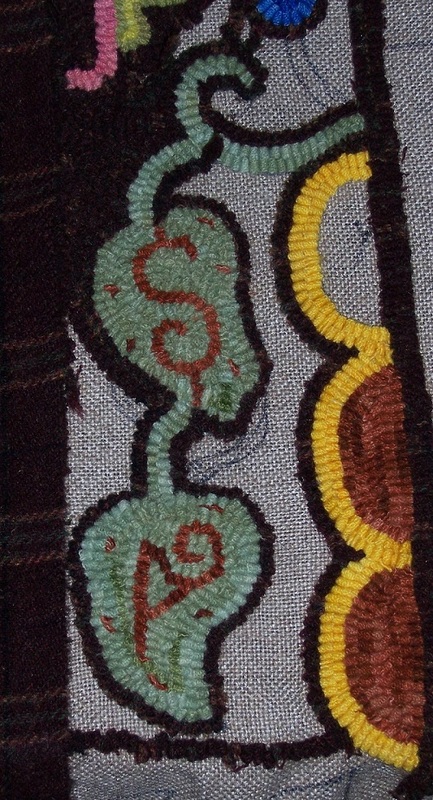 Often, I try something quite different after working on a rug with a very distinctive style…so we’ll see. 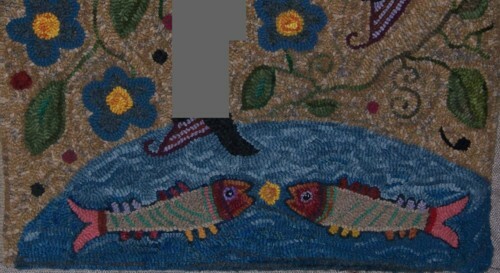 However, the freestyle folkart rug is always a favourite of mine so I don’t know if I can resist doing one!!! Hope you are having a lovely day…I will keep working for a few days (and resting after that marathon of hooking too!!!!!) …lol… and then get started on the next adventure. Often, I find a colour that I want to use and that dictates the flavour of my design. I have a lot of the darker plaid wools from my “primitive” hooking days…but I might be looking to lighten up for Spring! 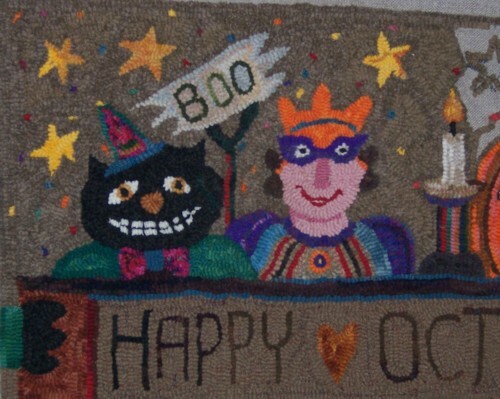 I also have a Chairpad Challenge on Rug Hooking Daily…and a “Soul Selfie” Challenge there too. So I’ll be busy…but happy too. 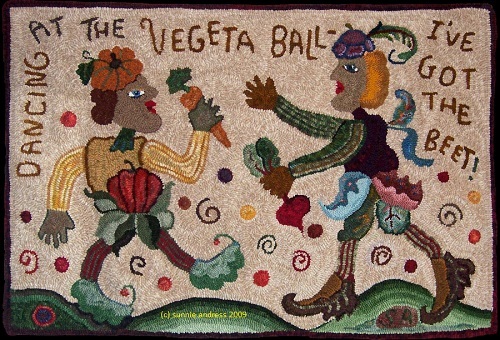 I am having fun with this new rug and it is just the start!!! 🙂 This one is approx 28 x 39 inches but I might change that or add a border so who knows!!! …lol… I am using a deep burgundy plaid for the background so it is quite dark. I have collected ideas, adaptations and my own drawings to pull together things from vintage botanical illustrations, ancient Celtic manuscripts, antique painted wood, papercutting and motifs from vintage book covers for the design. I know it sounds like a mish-mash of things but I hope to pull it all together!!! We shall see! You can see the background plaid very well in the second picture. I love the darkness and the colour blend…just what I need to set off the motifs and the lettering! I‘m being thrifty and bringing in some leftovers in this rug too…so that will be more experimentation with colour! There are little piles of wool all over the hooking room floor now so I can see what wild colours will look good with the blue background! Also, I can use some leftovers here too. I am using mostly #4 and #5 cut strips but will throw in (!!) a #3 and a #6 here and there…especially if it is a leftover woolworm. 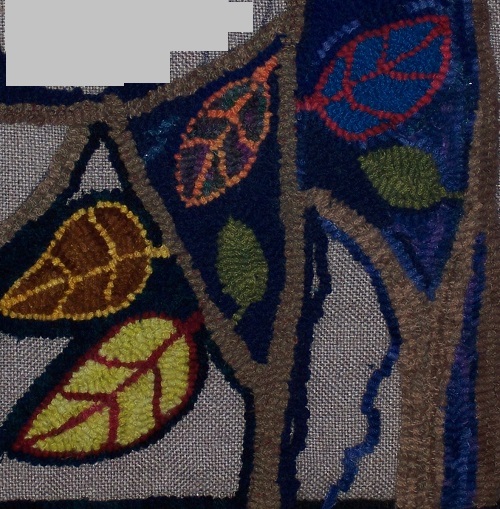 I need to be sure the transition from that dark blue to the blue and purple mottled wool works as I go across the rug. I’ll have to adjust things when I get more motifs and background hooked. With all the backing showing it is hard to see just what a few strips here and there will actually look like once all is finished. Here is Progress on Day 9…More background filled in and I am taking the picture with the light on the rug so you can see the background colours better. 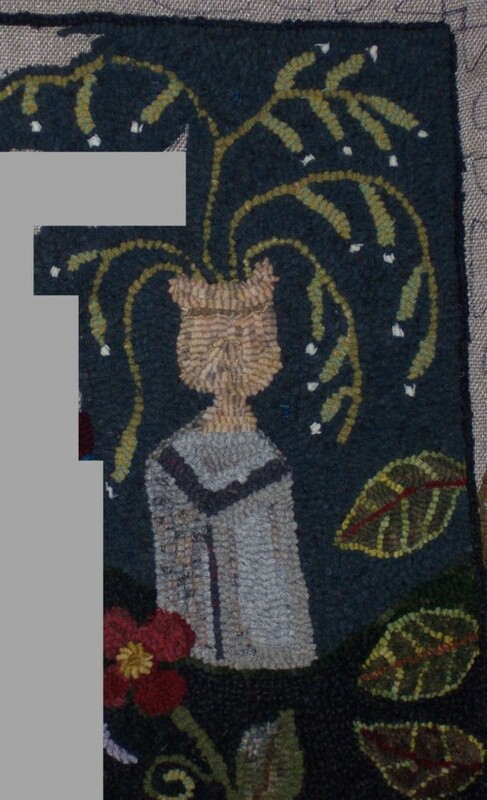 In regular light, the background changes are noticeable but the deep blue of the sky blends into the black and the dark green wools put in here and there. 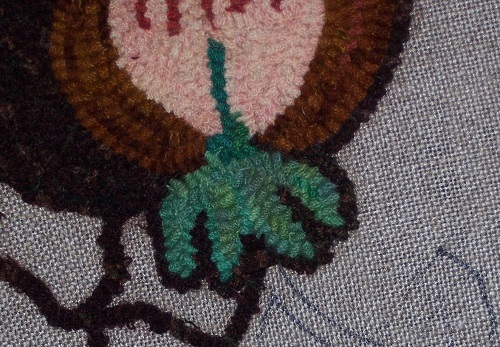 I am enjoying the colour experiments…it’s fun to see what the wools do when hooked close to each other. 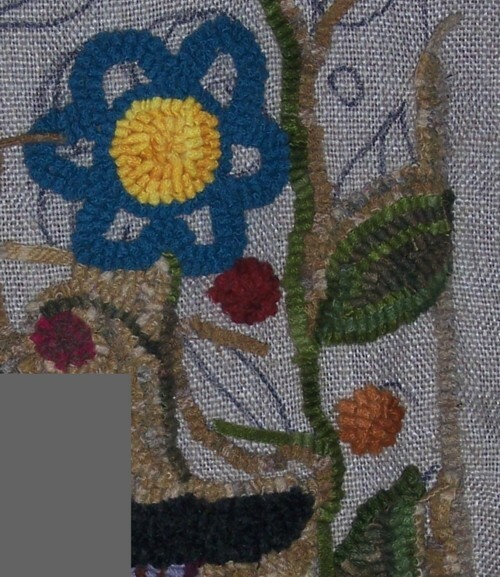 For tomorrow,, I will concentrate on the right side border and see if I can get more done. 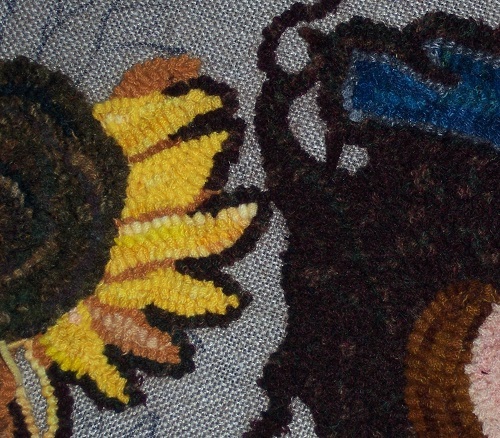 I am also gathering several of my rugs together that need the edges finished so I will be working on that too!!! It’s time I get a few of those rug s done. I hope you are all safe and well…hearing about the floods, the fires and the storms across the country is scary. We will be having some high temps here for a few days but we can deal with that. I did have some more time to do background above and in the banner too. I tried larger letters when I first did the banner but they were too dominant…so I did thinner and less obtrusive ones and I like it better. I wanted to celebrate the entire month of October so the friends are celebrating both Autumn and Halloween. My woolworm stocks are getting a little smaller!!!!!!! But I am happy with my choices of blues for that pond. As I said, the blues could be overwhelming so I tried to keep to the dyed lighter blue for the top part and a couple of blues for the pond bottom. I stuck in a few strips of the “flower blues” and put a few lighter strips in under the fish for just a little highlight. I also am happy with the fish. I think they are colourful without being “standouts”…and I used the tail pink wool in a couple of dots in other parts of the rug.